The standard types of painting tools and equipment will always be in use, as long as the paint products go unchanged in how they are applied. Paint spray equipment applications are not to be replaced. They are only approved upon by making subtle changes to spray guns and paint pumping systems. When it relates to the roller cover, its design is continually being re-examined for ways to improve its performance, primarily with new materials. Widely used tools and equipment are difficult to replace. Changes in supplies mean costly changes to a system which is already operating efficiently. A. Abrasives, caulking, patching compounds, masking materials, and other items. Changes: meet the demands of structural components and newer surfaces, also environmental changes. B. Sanding products produced for wet or dry use. Option: Abrasives affixed to a sponge type substrate, allowing greater flexibility. C. Caulking produced as waterborne and siliconized. Advantages: Resist cracking, and provide waterproofing, while allowing the surface to be painted. D. Patching compounds that dry faster and harder. Advantages: sand easier, allow painting sooner. E. Masking tapes designed to be left on the surface longer. Advantages: Do not pull the surface loose, and make re-taping unnecessary. Commonly used supplies have advanced little. They tend to fulfill the need, in an efficient manner, for which they have been designed. The quality of supplies must not be overlooked. They are your aid in producing a quality painting or finishing job. They sure can make it easier. By the way, a poorly adhering masking tape is not going to do you any favors. A. More paint brushes designed for applying multiple types of coating. Brush hairs are a composite of nylon, polyester, olefin, and other synthetic fibers. B. Roller frames designed to reduce the friction of the roller covers. Added feature: control the covers from slipping off of the roller frames. C. Roller covers, with new developments in nap composition. Advantages: Optimal nap composition which lasts longer, and is durable with various coatings. D. Advancements that consider the ergonomics of a tool’s use. Example: Joint knife, which must be very strong and flexible. It must provide an excellent grip and balance for effective use. Advancements in tools are needed, especially when a product or material has no way of being applied. A tool must be designed, tested, fabricated, and marketed to industry, business and public consumers. A. Fine finishing, hand-held and airless portable spray system. Designed for ease of use by the professional painter and finisher. Homeowner/general consumer models: easier to operate, clean, and maintain. B. Masking machines that are easy to manipulate in taping procedures. Normally for commercial, residential and automotive painting. C. Spray pumps designed for easier use by the homeowner/general consumer market. Features: lighter weight, easy to set up, simple to clean up. Pressure fluid: maintained electronically. Changes in equipment occur when use and testing point to an area of design which can be improved. I consider advancements, something which really alters the marketing of a piece of equipment. What marks a more advanced piece of equipment? Some key features: greater performance, more energy efficient, more ergonomics, and increased durability. A successful painting project requires that all intended and needed supplies, tools and equipment are available, reliable and qualitative. Consistently, they must help the painter to (1) produce above-standard workmanship, (2) achieve satisfactory-plus results, and (3) ensure cost-effective durability. PAINTER’S TIPS: Wisely choose each supply, tool and piece of equipment. Then, care and maintain each one properly. Maximize its potential usefulness and effectiveness on future projects, work orders and tasks. You’ll be glad that you did. Even the most advanced supply, tool, or piece of equipment is only as effective as the painter using it. Copyright 2014, 2017. Robert D. Hajtovik. All rights reserved. 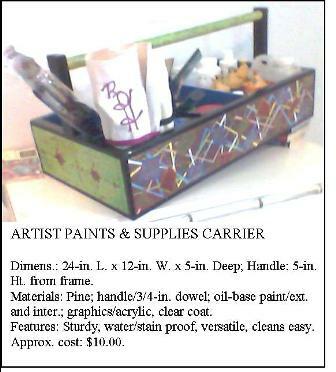 Sometimes, you need a carrier customized to fit the supplies you rely on. Here are some pieces that I’ve built. Each took one to three hours to complete. All at minimum expense. Mechanical repairs for a Maintenance Tech are no less important than the appearance of the room or space that you seek to improve. Surface repairs and painting can be learned to a point where you are as confident in doing it, as you are in performing your normal duties. Building skills as a painter/tech requires the ability to respond to a wide variety of conditions. You want to be ready to use appropriate methods of painting to improve the appearance of a commercial business. You want everyone to be satisfied with the work: guests, visitors, customers, supervisors, management, and yourself. 1. What every tech needs to know about the painting trade. A. Standard methods and techniques continue to work, when they match the criteria for which they were developed: surface/substrate, product/material, tools, equipment, environment. B. Paint store managers, manufacturer’s reps, and interior designers tend to be excellent resources. C. Many standard methods and techniques can be adapted – when used skillfully and carefully. D. Surfaces should be touched-up, when you know the exact paint used before – or you are very skilled at mixing, matching and blending products, colors and textures. E. For best results, the existing area should be blended with the touch-up or newly painted area.F. Before painting, the area should be prepared, so the new application matches the surface. F. To preserve brushes, roller covers, work container, etc., clean them at the end of each day. 2. What every tech needs to know about painting and finishing products, in general. A. Three main categories of products include waterborne (water-based), solvent borne(oil/petroleum-based), and catalyst activated (eg. epoxy, urethane). B. Generally, these products are composed of latexes, oils, urethanes, epoxies, and polyurethanes. C. Many more types of products are available. D. Products are designed for interior, exterior, and both interior/exterior applications. 3. What every tech needs to know about hotel/facility painting. A. Touch-up paint color/tint that you use must match the paint on adjacent surfaces. B. Some work orders can’t wait until you complete your current project or task. C. Your chief engineer is your supervisor – not any other department manager. D. When you stand in for the painter, both he and your supervisor are counting on you to do a good job – and to follow the rules and procedures. E. Advance notice of the designated work areas, and “WET PAINT” use must be given to others. F. Making note if more paint, supplies, etc. are needed helps you get job done on schedule. 4. What every tech needs to know to handle priority painting work orders. A. Clearly understand what’s needed, also any limits – eg. time, budget, non-budgeted needs. B. Select products/materials, tools, etc. based on need, inventory, budget/cost, time, traffic, etc. C. Select method or technique based on surface/substrate and condition, location, time limit, etc. E. Any work area – guest room, public restroom, restaurant, pool area, etc. – must be unoccupied, or “OUT OF ORDER” to complete the work safely and satisfactorily. 5. TIPS: Training techs to perform basic painting tasks professionally. A. Respect each tech’s unique set of skills and abilities, and known limitations. C. Find out the type(s) of painting projects they have worked on. What did they do? How often? For how long? Which were under no…little …a lot of supervision? D. Assume they know the basic brush and roller techniques for materials to be used. E. SHOW THEM the proper paints for specific areas. F. Ensure that all techs, who will do paint-shop work, can repair areas that need to be painted. 6. TIPS: Training techs basic painting – the journey-apprentice way. A. Work side-by-side with each trainee to ensure continuity in his or her workmanship. B. Help each tech to find his or her comfort level using required methods, products, tools, etc. C. Provide techs with tools of quality equal to those used by a journey instructor, or painter. D. SHOW techs the basic methods of repairing wall damages on different surfaces and areas. E. SHOW techs the proper way to spray paint a large surface. Include safety requirements. An engineering/maintenance tech’s painting savvy will be only as sharp as the quality of his or her training; access to needed products, materials, supplies, and tools; and on-going support (departmentally and interdepartmentally). There’s one way to operate a hotel or facility paint shop. That is with a set of easy-to-follow policies and guidelines (vs. rules) that fit the engineering department – and the organization. The shop size can total one wall with a few shelves, a large room with a separate workshop area, or an entire small building, or shed. The rules will be the same, basically. Some PAINT SHOP basics: JUST DO IT! JUST DO IT: Keep shop neat. Picked up. Swept up. JUST DO IT: Keep shop floor clean, and clear of parts, tools; spills, piles of anything, garbage. JUST DO IT: Keep workshop clean, swept up and ready for next project. JUST DO IT: Put things away – and in their proper places – when you’re finished with them. DON’T DO IT: No “borrowing” of paint shop/engineering/company property for personal use. DON’T DO IT: No “loaning” or “giving” of paint shop/engineering property to other departments – unless your supervisor authorizes. TIP: Get a written authorization. 1. Set up a Sign-out and Sign-in system for all paint shop property. 2. Put up a Paint Shop bulletin board. Post inventory list, requisition list, FYIs, cartoons, etc. TIP: And, keep those lists updated! 3. Tightly close all cans, bottles, tubes, boxes, bags, containers, etc. 4. Thoroughly clean all tools before storing back on the shelf, in the cupboard, in kiosk, etc. 5. Clean equipment; and make a note of any repairs needed, before returning to its proper storage area(s). A. Flush out spray gun spray lines. Clean nozzles, tips, hoses, product containers, etc. B. Soak and clean spray guns to prevent sticking, clogging, damage to mechanisms. C. Empty out any unused product from container; place in storage container for recycling – eg. paint, polyurethane, chemical treatment. D. Wash out each container with appropriate cleaning agent. Let dry. 6. Do basic repairs and maintenance on tools and equipment before storing. 7. Store products and materials appropriately and safely. Follow MSDS, UBC, HAZMAT, EPA codes. A. All cans, spray cans, bottles, boxes, tubs: Upright. B. Wallcovering rolls, boxes: Upright.All tubes – eg. paint, tinting. 8. Store all tools and equipment in a safe manner. 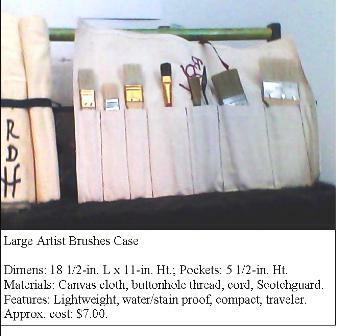 A. Brushes: Bristles up (no cover); bristles upright (sturdy cover); bristles down (in “wet-storage” brush container). B. Roller covers: on end, to maintain nap integrity. C. Electrical tools: Turn to “OFF” position before re-shelving, re-storing. D. Mechanical tools: Close/fold up handles and levers before re-shelving or re-storing. E. Saw blades, sharp edges: Remove, retract, or cover. Store in visible spot of toolbox/cabinet. F. Sharp objects, scissors: Close up; place with handles up, or facing YOU. G. Razor blades: Retract into holders/handles; or store individually in closed, marked box. 9. Store nuts, bolts, washers, screws, etc. 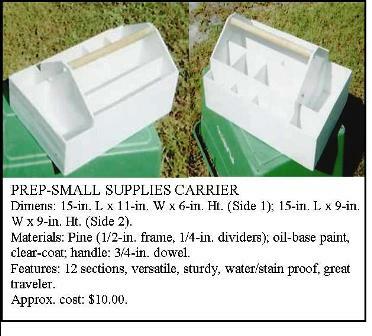 in plastic organizer boxes – or small plastic/metal containers. 10. Store small tools in divided tool chest, toolbox, small carry-all, unbreakable containers. 11. Store like products together, like materials together, like tools together, etc. 12. Store all products, materials, supplies, tools, and equipment in dry, safe places. 13. Keep records of inventory use, loss, breakage, disrepair, “retirement,” etc. 14. Regularly, post a list of items that (a) are running low, (b) need to be requisitioned – and when, (c) need to be RUSH ordered, (d) are no longer used or kept in stock. 15. Post in visible spot a running list of your requisitioned items. Keep track of requisition and order status. Display date of order. 16. Requisition basic supplies before you get low. Keep checking with supervisor and/or purchasing manager about their order and delivery status. 17. Be cost-conscious and budget-time aware in selecting and ordering products, materials, supplies, new tools, etc. 18. Know which products, materials, supplies, etc. cannot be compromised – quality and durability versus cost. 19. Keep accurate records. Neat, complete, easy-to-understand, easy-to-use. 20. Discard products and materials that are no longer usable – dried up, discolored, faded, damaged (mold, mildew, water, sun); frayed, bug-infested. ** TIP: Fill partially full containers of paint, stain, varnish, etc. with sand, or other absorbent. 21. Discard products, materials, supplies, etc. that do not meet product standards and safety codes. WHY: Regulators and inspectors are watching. Too, people can get very ill.
22. Promptly discard damaged or broken tools and equipment that cannot be repaired – and are too dangerous to use in present condition. WHY: FIRE and SAFETY hazards. 23. Discard used rags, paper towels, etc. – especially those with strong odors, fumes, residue. ** TIP: Soak rags in soapy water to neutralize combustibility or flammability. 24. Report problems promptly to your supervisor, and to teammates. Keep everyone informed! 25. Promptly report losses, damages, and thefts of products, materials, supplies, tools, equipment. WHY: It’s company policy! Also, some items may need to be replaced a.s.a.p. Comply with the safety rules on an ongoing basis. It’s the best way to prevent accidents in your paint shop. Establish policies and guidelines that are DO-ABLE. Establishing that policy and practice helps all of your teammates – especially engineering/facility – keep the paint shop looking good, and working great! For everyone! “Inventorying” your paint shop inventory is one thing. Creating – gridding out – spaces/places for everything is another challenge – and opportunity. Putting and keeping your inventory in its place is a third challenge. Maintaining your paint shop inventory can be a major challenge. An ongoing one, in fact. Especially, if your budget is constantly in the “cutback” mode. Take heart, fellow painters! Especially if you’re responsible for paint shop operations. Sooner or later, you will get the support you need to run your shop right. So that it can benefit the organization, and the people it’s meant to serve. 3. Putting and Keeping Everything in Its Place. Keep related items together. A. Label each can, container, box, package before placing it on a shelf, in a cupboard, etc. (1) Tape appropriate COLOR CHIP on the lid and front of every can of paint, stain, varnish, etc. (3) Tape a PATTERN SWATCH on the top and front panel of every box, package, roll of wallcovering. —-Tape a note showing current date, approximate quantity, designated area where item is used. B. Do the same for your custom tinted and ordered products and materials. 4. Maintain a Paint Shop Inventory List. A. Install a MASTER LIST on your shop computer. (1) Identify where each category of items is located: General area, cupboard, storage shed, etc. (2) Remove specific items when you use them up or discard them. (3) List new items when they come into the shop. Include items to be used up same day as delivery. (4) Update your list every month. Know where you stand supply-wise. B. Print out at least two hard copies of the list. Do this on a quarterly basis, at least. (1) Put one copy in very conspicuous spot in the Paint Shop. (2) Give a folder/bound copy to your supervisor. NOTE: An inventory list can be an immense help at budget time, departmental supplies requisitioning times, for departmental meetings, when someone takes over for you (eg. annual vacation, illness, injury). TIP 1: Make use of free-standing tool and supply kiosks – for small items. TIP 2: Clean, empty paint cans and buckets make handy storage containers – eg. 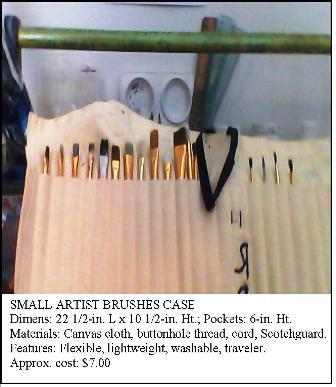 small brushes, roller covers, extenders. TIP 3: Plastic 2-to-4 drawer storage units, on rollers, make great “Good-to-Go” portables for multiple projects/work orders that require similar supplies and tools. Dollar and charity thrift stores can be great places to buy these. TIP 4: Put “dead” space to work for you. Under shelves, between cupboards, cabinets, on walls, etc. TIP 5: Is your storage space limited? Place often-used products and materials in their own smaller section, area, cupboard, etc. Then, organize the rest by interior and exterior. TIP 6: Place little-used products and materials in a nearby, accessible storage area/room. Example: Engineering supply shed. Get your supervisor’s approval beforehand. Take heart, fellow painters! Especially, if you are responsible for paint shop operations. Better days and better ways are ahead for you. And, your Paint Shop!